Erosive pustular dermatosis of the scalp (EPDS) is a rare inflammatory disease with unknown etiology that usually occurs in the elderly. It is characterized by multiple sterile pustules, chronic crusted erosions, cicatricial alopecia, and skin atrophy. It typically develops in aged or sun-damaged skin and is most often accompanied by a history of local trauma. Histopathologically, non-specialized change manifests as atrophic epidermis and chronic inflammation. 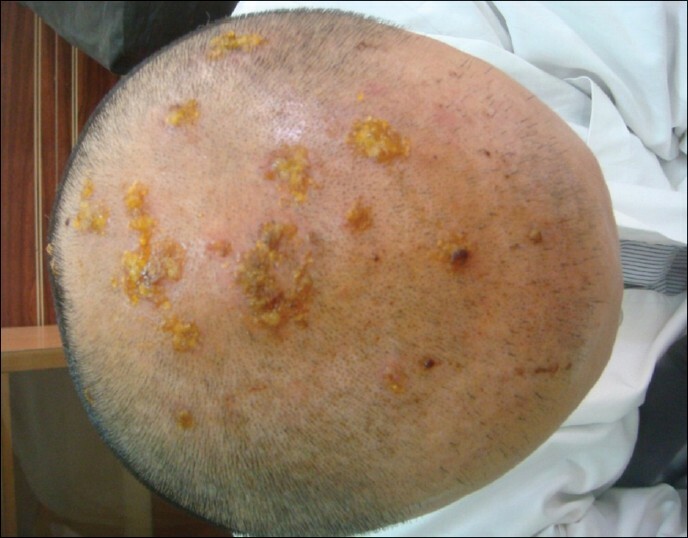 Although this disease mainly occurs in elderly white women, we here report a case of EPDS in a 35-year-old man, following hair transplantation as a local trauma, that was successfully treated with topical steroid. Its association with autoimmune diseases has also been described. However, the pathogenesis of EPD remains unclear. Cultures are generally negative, and laboratory and histopathological evaluations are not diagnostic. 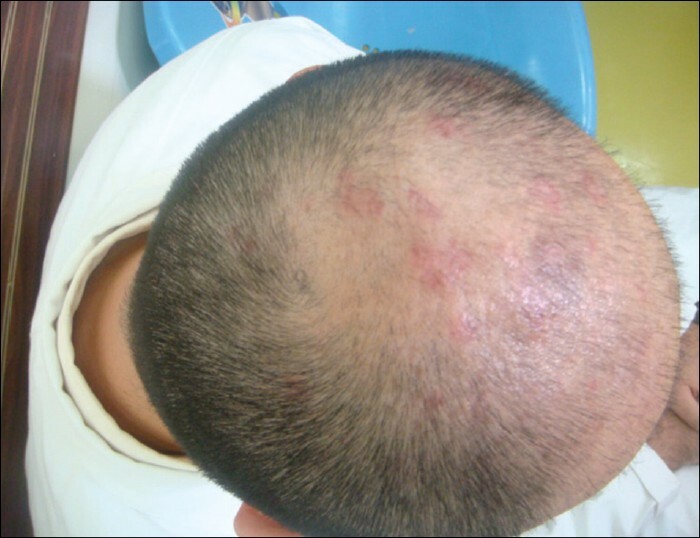 A 35-year-old man, otherwise healthy, developed erosive crusted plaques on his scalp 9 months after hair transplantation for treatment of long-standing, male-type, androgenetic alopecia. Also, he suffered from mild burning sensation without other symptom such as pain, pruritus, and malodoration, and he did not use any medication such as topical minoxidil before development of this lesion. Despite treatment with topical and systemic antibiotics, the lesions enlarged gradually. He was referred to us for evaluation of the eruption. On physical examination, a large ulcerative plaque covered with crusts was seen on the parietal part of his scalp [Figure 1]. The remainder of the skin examination was essentially normal, with no features of a blistering disorder or psoriasis. There was no evidence of lymphadenopathy in head and neck on examination. Bacterial and fungal culture evaluations were negative. Routine laboratory blood tests were normal except for elevated values of markers of inflammation (erythrocyte sedimentation rate, C-reactive protein). Autoantibodies (antinuclear antibodies, rheumatoid factor, thyroglobulin, and microsomal antibodies) were negative. No abnormal finding was seen on serum immunoglobulin levels, anti-desmoglein 1 and 3, and anti-BP180 antibodies. 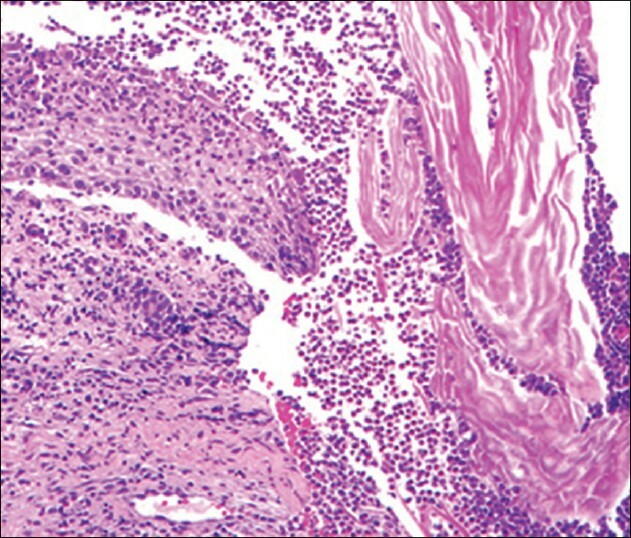 No evidence of internal malignancy or infectious focus was revealed by various systemic examinations including chest X-ray, abdominal sonogram, and computed tomography. After referral to us, a skin biopsy was done from the lesional area; we diagnosed the patient's eruption as EPD of the scalp. The patient was treated with topical clobetasol propionate lotion, twice daily, which resulted in significant pustular lesion improvement and re-epithelization within a week [Figure 2]. A Histopathological examination of a 3-mm punch biopsy showed a dense, mainly perifollicular, dermal infiltrate of neutrophils and lymphocytes. There was no evidence of malignancy or vasculitis [Figure 3]. Direct Immunofluorescence findings were negative, ruling out the possibility of autoimmune blistering disease. Special staining for fungi was negative. Several drugs have been tried to treat this disease, normally with partial improvement. Potent topical steroids have been widely used in EPDS  and, often, there is a good response to potent topical corticosteroids, but typically with a relapse when treatment is stopped. The following treatment regimens have been reported to be effective: Oral isotretinoin, zinc sulphate, nimesulide, topical tacrolimus, or calcipotriol. ,, Curiously, a single case treated with photodynamic therapy has also been described. Topical application of corticosteroid may suppress the keratinocyte production of this neutrophil attractant, thereby exerting therapeutic effect. Our patient was treated successfully with topical steroid plus oral zinc sulphate. We controlled the patient's condition for 6 months after his wound had healed; the result was that no relapse occurred. Our experience and success with topical steroid for EPDS is observational and not the result of a randomized, controlled trial. 1. Pye PJ, Peachey RDG, Burton JL. Erosive pustular dermatosis of the scalp. Br J Dermatol 1979;100:559-66. 2. Trueb RM, Krasovec M. Erosive pustular dermatosis of the scalp following radiation therapy for solar keratosis. Br J Dermatol 1999;141:763-5. 3. Petersen BO, Bygum A. Erosive pustular dermatosis of the scalp: A case treated successfully with isotretinoin. Acta Derm Venereol 2008;88:300-1. 4. Yamamoto T, Furuse Y. Erosive pustular dermatosis of the scalp in association with rheumatoid arthritis. Int J Dermatol 1995;34:148. 5. Guarneri C, Vaccaro M. Erosive pustular dermatosis of the scalp following topical methylaminolaevulinate photodynamic therapy. J Am Acad Dermatol 2009;60:521-2. 6. Rongioletti F, Delmonte S, Rossi ME, Strani GF, Rebora A. Erosive pustular dermatosis of the scalp following cryotherapy and topical tretinoin for actinic keratoses. Clin Exp Dermatol 1999;24:499-500. 7. Mastroianni A, Cota C, Ardigo M, Minutilli E, Berardesca E. Erosive pustular dermatosis of the scalp: A case report and review of the literature. Dermatology 2005;211:273-6. 8. Ena P, Lissia M, Doneddu GME, Campus GV. Erosivepustular dermatosis of the scalp in skin grafts: Report of three cases. Dermatology 1997;194:80-4. 9. Grattan CE, Peachey RD, Boon A. Evidence for a role of local trauma in the pathogenesis of erosive pustular dermatosis of the scalp. Clin Exp Dermatol 1988;13:7-10. 10. Layton AM, Cunliffe WJ. A case of erosive pustular dermatosis of the scalp following surgery and a literature review. Br J Dermatol 1995;132:472-3. 11. Hashimoto N, Ishibashi Y. Pustular dermatosis of the scalp associated with autoimmune diseases. J Dermatol 1989;16:383-7. 12. Kim KR, Lee JY, Kim MK, Yoon TY. Erosive pustular dermatosis of the scalp following herpes zoster: Successful treatment with topical tacrolimus. 2010;22:232-4. 13. Burton JL, Peachey RD, Pye RJ. Erosive pustular dermatosis of the scalp-a definition. Br J Dermatol 1988;119:411. 14. Darwich E. Munoz-santos C, Mascaro JM Jr. Erosive pustular dermatosis of the scalp responding to acitretin. Arch Dermatol 2011;147:252-3. 15. Cenkowski MJ, Silver S. Topical tacrolimus in the treatment of erosive pustular dermatosis of the scalp. J Cutan Med Surg 2007;11:222-5. 16. Caputo R, Veraldi S. Erosive pustular dermatosis of the scalp. J Am Acad Dermatol 1993;28:96-8. 17. Boffa MJ. Erosive pustular dermatosis of the scalp successfully treated with calcipotriol cream. Br J Dermatol 2003;148:593-5. 18. Meyer T, Lo' pez-Navarro N, Herrera-Acosta E, Jose A, Herrera E. Erosive pustular dermatosis of the scalp: A successful treatment with photodynamic therapy. Photodermatol Photoimmunol Photomed 2010;26:44-5. 19. Sawada Y, Bito T, Kawakami C, Shimauchi T, Nakamura M, Tokura Y. Erosive pustular dermatosis of the scalp and leg associated with myasthenia gravis: A possible pathogenetic role for neutrophil-stimulating cytokines and chemokines. 2010;90:652-3.